Reverse osmosis technology is currently the best water filtration technology in the world. It is reccomended for areas with very "difficult" water (salts, hardness, heavy metals, carcinogens, arsenic, nitrates etc). 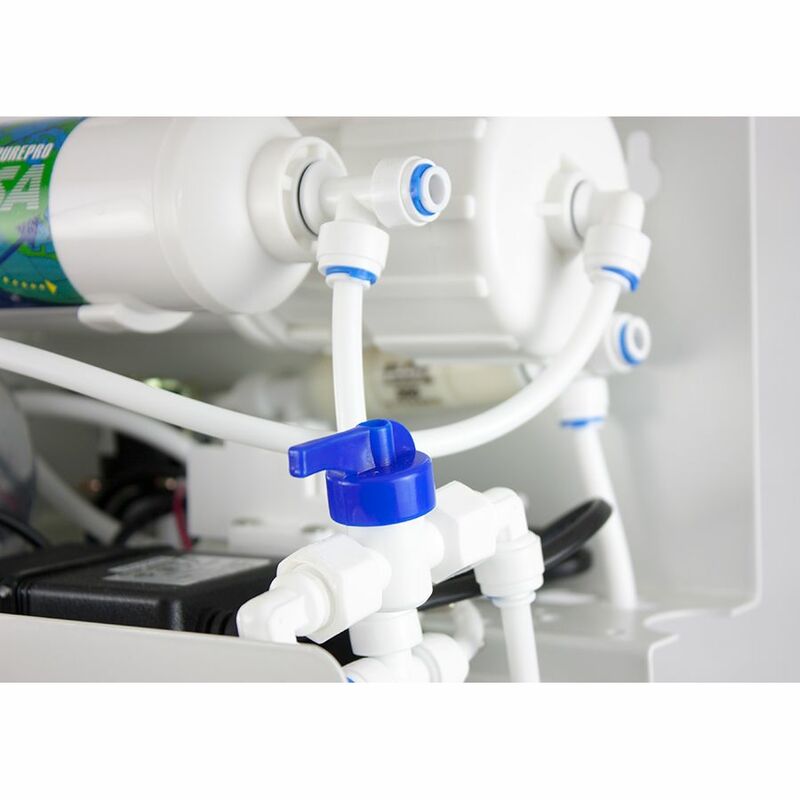 This model has also an electrical pump that allows the RO to work faster. Ideal if you suffer from low water pressure.It comes with a 10 year warranty! Included in the packaging. Height 24 cm. Checkout the installation video we have prepared for you in the "Video" tab. You'll have to drill a hole in your kitchen counter in order to install this tap (hole diameter 1cm). 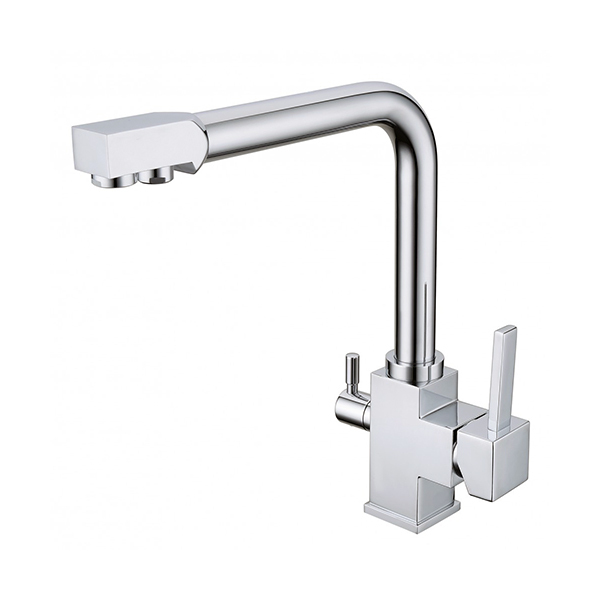 This tap is used only for filtered water and doesn't repalce your kitchen tap. It comes with a 2 year warranty. Height 27,5 cm. Checkout the installation video we have prepared for you in the "Video" tab. You'll have to drill a hole in your kitchen counter in order to install this tap (hole diameter 1cm). 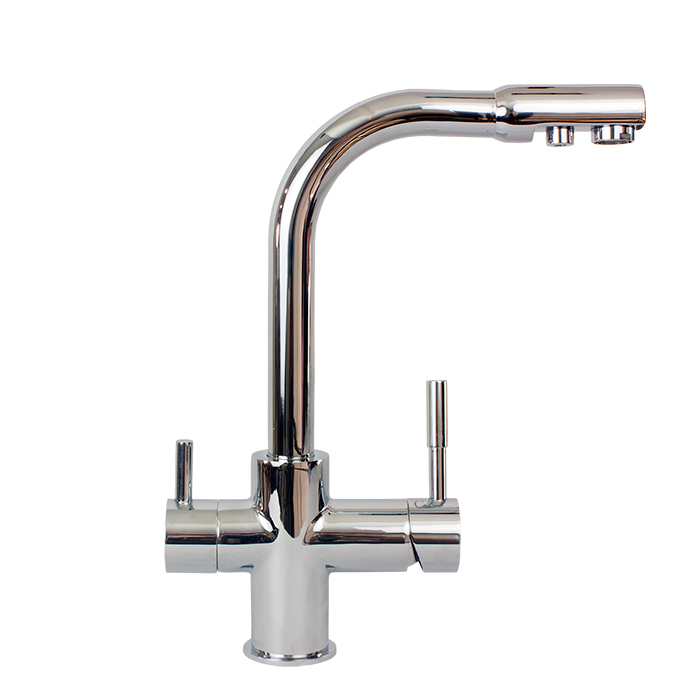 This tap is used only for filtered water and doesn't repalce your kitchen tap. It comes with a 2 year warranty. Height 29 cm. Checkout the installation video we have prepared for you in the "Video" tab. You'll have to drill a hole in your kitchen counter in order to install this tap (hole diameter 1cm). 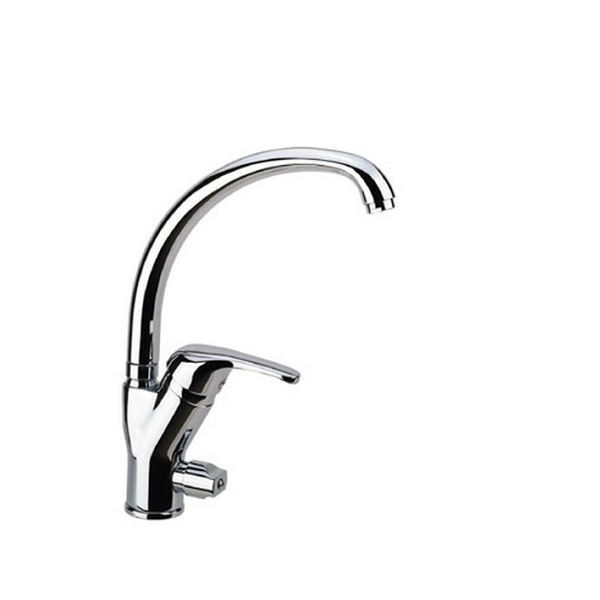 This tap is used only for filtered water and doesn't repalce your kitchen tap. It comes with a 2 year warranty. This is a 3-way tap. It replaces your kitchen tap. 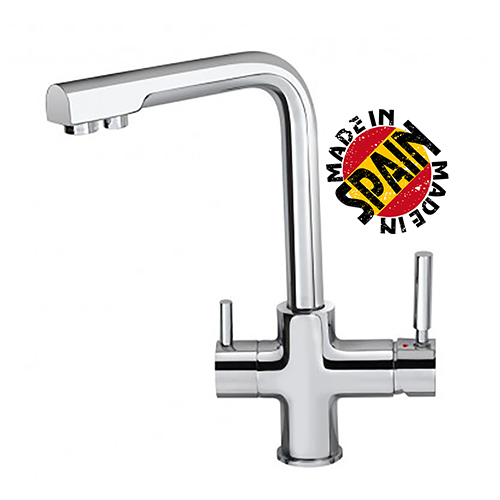 You can use it as a normal kitchen tap (unfiltered mixed hot and cold water). It has a separete switch just for filtered water. It comes with a 2 year warranty. This is a 3-way tap. It replaces your kitchen tap. 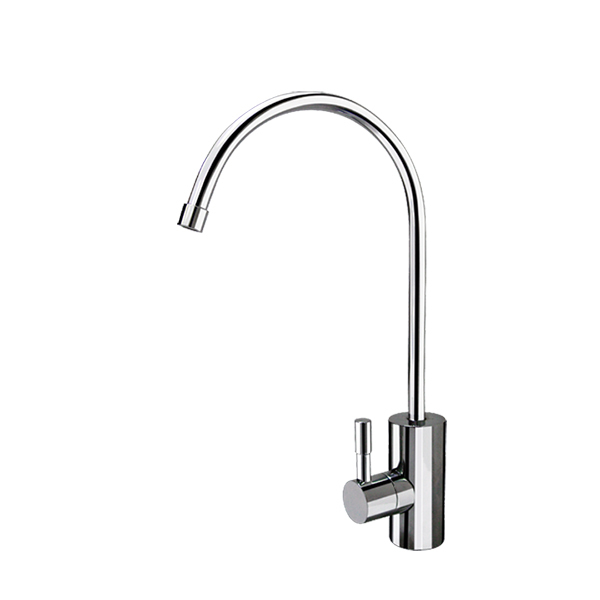 You can use it as a normal kitchen tap (unfiltered mixed hot and cold water). It has a separete switch just for filtered water. It comes with a 2 year warranty. Black colour. 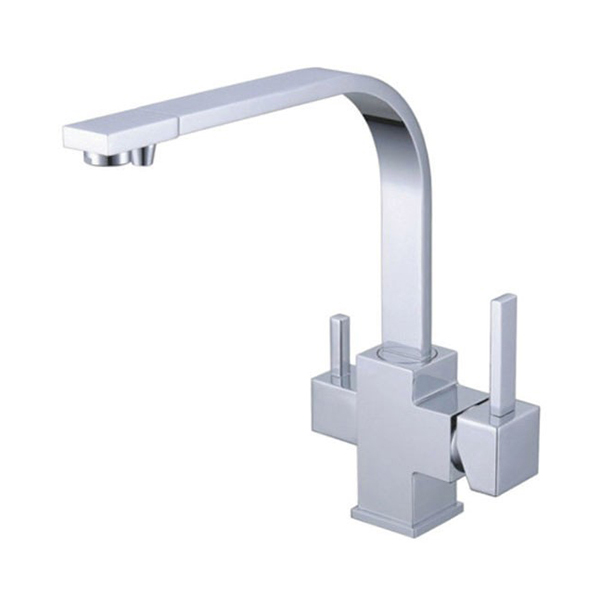 This is a 3-way tap and replaces your kitchen tap. 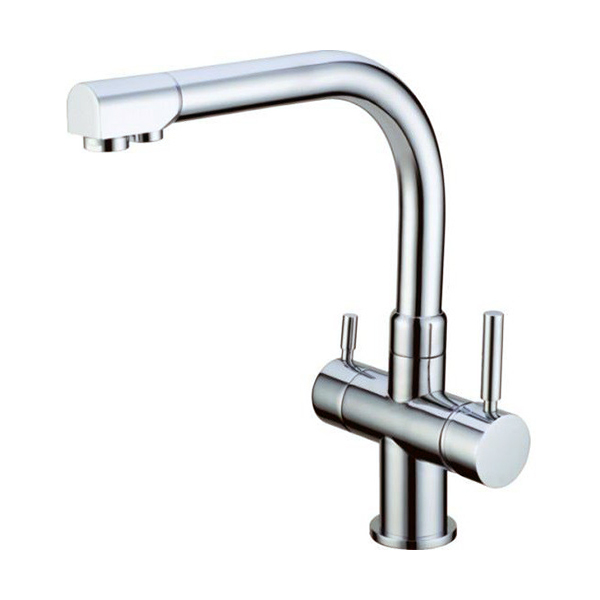 You can use it as a normal kitchen tap (unfiltered hot and cold water). It has a separate switch just for filtered water. It comes with a 2 year warranty. Height 32.5cm. Made in Spain. 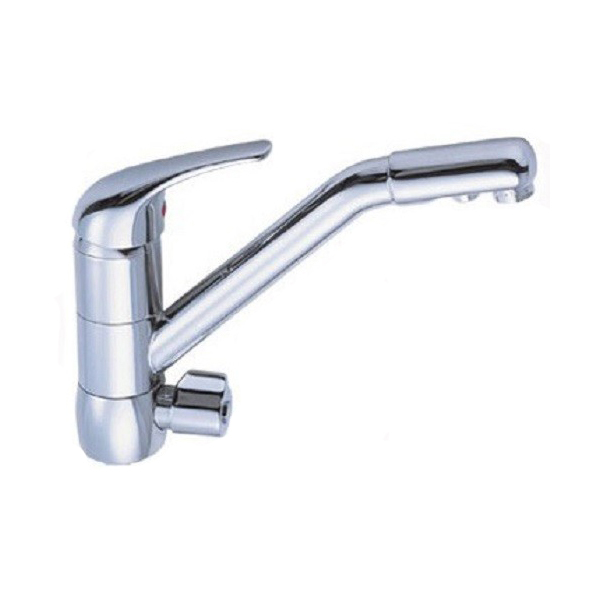 This is a 3-way tap and replaces your kitchen tap. 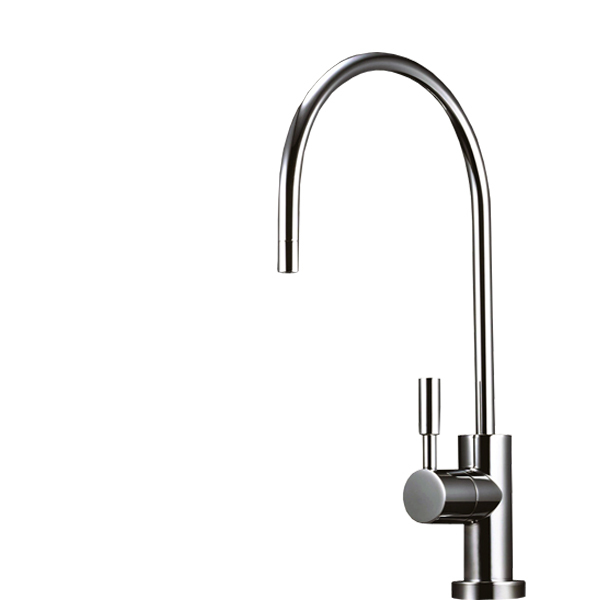 You can use it as a normal kitchen tap (unfiltered hot and cold water). It has a separate switch just for filtered water. It comes with a 2 year warranty. Height 32cm. Produces water with zero conductivity. Is ideal for areas with very hard water (eg islands) and water with high levels of arsenic or nitrates. Completely removes all the harmful substances from the water. Includes all parts & accessories needed for connection and installation. Needs expert hands or plumbing for installation. Is placed under the kitchen counter. 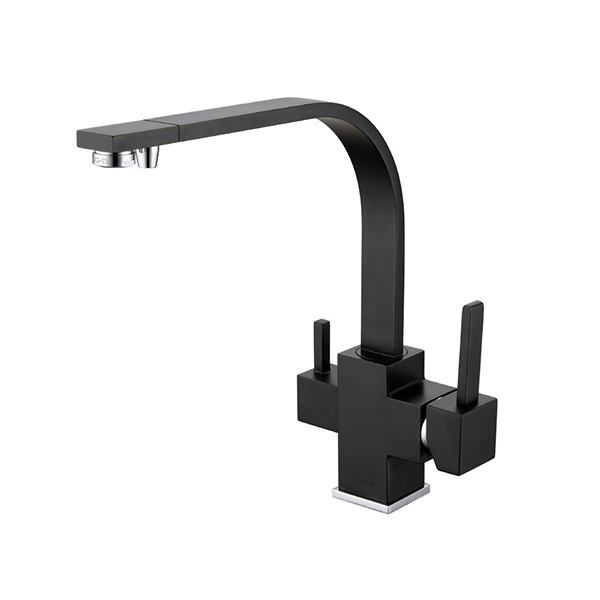 Filtered water comes out of Primato DELUXE 101 faucet. You can select a different faucet if you want to. Price will change automatically. It has a small tank where clean water is stored. This is because water is produced very slowly by reverse osmosis. So you do not have to wait at all to enjoy a glass of crystal clear water. It comes with a 10 year warranty! This model has an electrical pump (between the first and the second stage) which allows it to work faster. This RO is ideal if you have low water pressure. 1st stage: Water passes through the polypropylene filter (PP) with a permeability of 5 microns. To give you rough idea, human hair have a diameter of 100 microns. At this stage, dirt, dirt, rust and sludge are retained. This filter protects the activated carbon block filters from clogging. 2nd stage: Water is filtered by the Primato ULTRA CTO activated carbon block filter (5 microns). This filter reduces chlorine, chloroform, unpleasant taste, odor, suspended particles, sand, rust and a wide list of chemicals. 3rd stage: Water is filtered by the Primato ULTRA PB activated carbon block filter (0.5 microns). 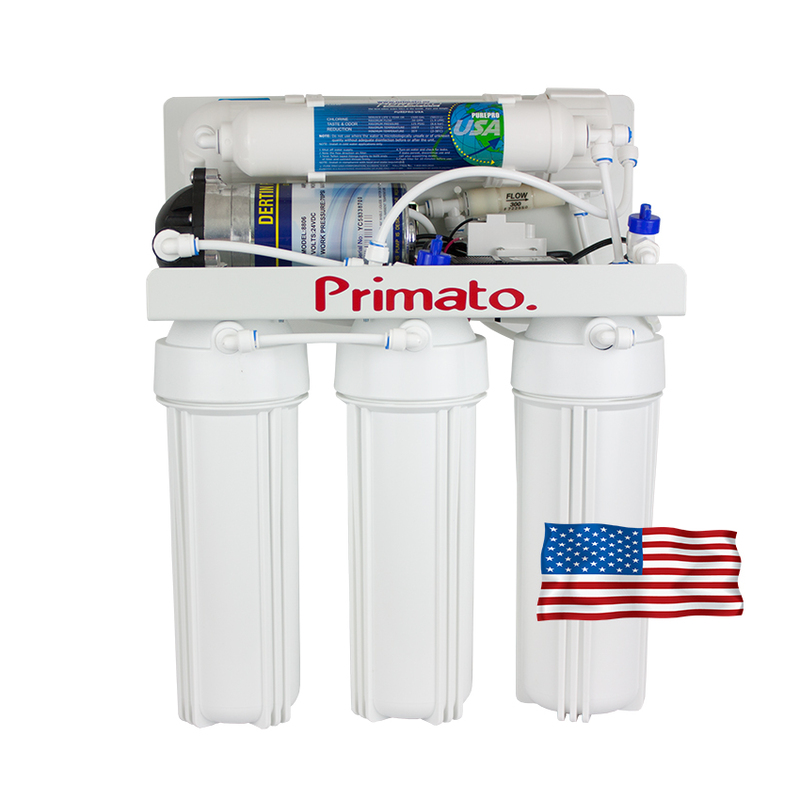 This filter reduces chlorine, organic volatile compounds (VOCs), organic chemicals, unpleasant taste and odor, suspended particles, turbidity, sand, rust, heavy metals, lead and other pollutants that contaminate water. 4rth stage: Water is forced to pass through the reverse osmosis membrane. The membrane has a permeability of 0.0001 microns. RO membrane can remove salts, hardness, nitrates, chromium, arsenic, poisons, germs, microbes, lead, bacteria and literally all harmful elements. The water is then stored in the tank. 5th stage: Once you open the tap, the water will go through the fifth and final filtration stage. In the fifth stage we use an activated carbon filter from coconut. This filter also acts as a flavor enhancer. At this stage you can put a metal enrichment filter. Reverse osmosis technology is currently the best water filtration technology in the world. It is reccomended for areas with very "difficult" water (salts, hardness, heavy metals, carcinogens, arsenic, nitrates etc). Στο εξοχικό έχουμε ώσμωση χωρίς αντλία, στο σπίτι που μένουμε μόνιμα επέλεξα αυτό το σύστημα. Μπορώ να πω ότι η αντλία κάνει τη διαφορά γιατί είμαστε έξι άτομα στην οικογένεια και ήθελα γρήγορη παραγωγή νερού. Προτίμησα πάλι υδραυλικό για την εγκατάσταση - χρειάστηκε σαράντα λεπτά. Το νερό άψογο, η εξυπηρέτηση από τους τεχνικούς της εταιρίας αψεγάδιαστη. Κατέληξα σε αυτό το σύστημα έπειτα από αρκετή έρευνα. Έχετε υπόψιν ότι τα φίλτρα μέσα είναι πολυπροπυλένιο + άνθρακας + άνθρακας ενώ στα πιο πολλά "φθηνά" συστήματα τα φίλτρα είναι πολυπροπυλένιο + άνθρακας σκόνη + πολυπροπυλένιο. Μου αρέσουν οι σωστές δουλειές και μου άρεσε η εγγύηση, δείχνει ότι η εταιρία πιστεύει πολύ σε αυτό το προϊόν και το στηρίζει. Για τη σύνδεση προτιμήστε υδραυλικό αλλά μόλις τον δείτε να ζορίζεται πάρτε τηλέφωνο στην εταιρία, είναι πολύ εξυπηρετικοί και γνώστες του αντικειμένου. Το νερό μου φάνηκε στεγνό στην αρχή αλλά το συνηθίζεις. Ένα μεγάλο μπράβο για την εξυπηρέτηση πρώτα και δεύτερον για την βοήθεια στην εγκατάσταση. Το πέρασε ο άνδρας μου (με αρκετά τηλέφωνα στην εταιρία) και μας πήρε αρκετή ώρα αλλά στο τέλος δικαιωθήκαμε. Κάνει λίγο θόρυβο όταν γεμίζει η δεξαμενή (η οποία την πρώτη φορά γέμισε σε μία ώρα). Μετά όμως το σύστημα λειτουργεί μόνο όταν πίνεις από το φίλτρο. Το νερό στην αρχή φαίνεται "στεγνό" αλλά το συνηθίζεις. Στην περιοχή μας έχουμε αρκετά άλατα και νιτρικά οπότε η αντίστροφη ώσμωση ήταν μονόδρομος. Έχουμε μικρή κουζίνα και δυστυχώς το μηχάνημα μας πήρε το μισό χώρο από το ντουλάπι. Αλλά δεν είχαμε άλλη λύση καθώς στην περιοχή μας έχουμε πολύ σκληρό νερό και πολλά νιτρικά. Κοινώς το νερό δεν πίνεται. Λίγο ζόρικη εγκατάσταση, πρέπει να πιάνουν τα χέρια σου αλλιώς καλύτερα υδραυλικός...Το καλό είναι ότι σταματήσαμε να κουβαλάμε τα εμφιαλωμένα, κάτι που μας είχε κουράσει όλους. Εκπληκτική εξυπηρέτηση, μπορώ να πω με σιγουριά ότι μιλούσαμε μισή ώρα στο τηλέφωνο, κάτι πρωτόγνωρο για τα σημερινά δεδομένα. Το μηχάνημα θέλει σίγουρα υδραυλικό για την εγκατάσταση και είναι απαιτητικό στον χώρο που χρειάζεται στο ντουλάπι της κουζίνας. Μου άρεσε η εγγύηση γιατί κυκλοφορούν διάφορα φθηνά κινέζικα στο εμπόριο που ήθελα να αποφύγω. Προτίμησα το σύστημα με την αντλία γιατί δεν έχουμε πολύ πίεση εδώ. Πιάνει αρκετό χώρο στο ντουλάπι της κουζίνας. Το νερό είναι όντως εκπληκτικό αλλά μας πήρε μερικές μέρες για να το συνηθίσουμε. "How do I choose the right cartridge for my water filter?" Below the "Add to cart" button you can click on "HOW TO CHOOSE THE RIGHT FILTER". A text will appear on your screen summarizing the functions of available replacement filters for this water filter. Other replacement filters fit into your housing as well, but because there are a lot, we only recommend specific filters. Also, just below the product description, you will see the available cartridges. If you click on the quick view "eye" you will see a summary of the specific cartridge. If you click on the image, you will be taken to the cartridge page where you can see more details. If you have not yet decided which replacement filter is right for your water filter, simply contact us! We will be happy to assist you! "Should I install a filter on the counter or under the kitchen counter?" This depends on your needs and the available space in your kitchen. Generally speaking, the countertop filters can be installed in seconds, but they take up space on the kitchen counter. Under-sink filters do not require space on the bench, but they need skilled hands for installation or even a plumber. "I do not know if I need a single, double or triple filter"
If you are having problem with your water's bad taste and odour, then you need a single filter. But if you also have a lot of dirt in your water, then you need a double filter - the first stage will be a filter for reducing mud and the second one an activated carbon filter for reducing chemicals. But if you have 3 problems (eg hard water, mud and bad taste), then you need a triple filter, one for the reduction of scale, one for the mud and one for improving taste and reducing chemicals. 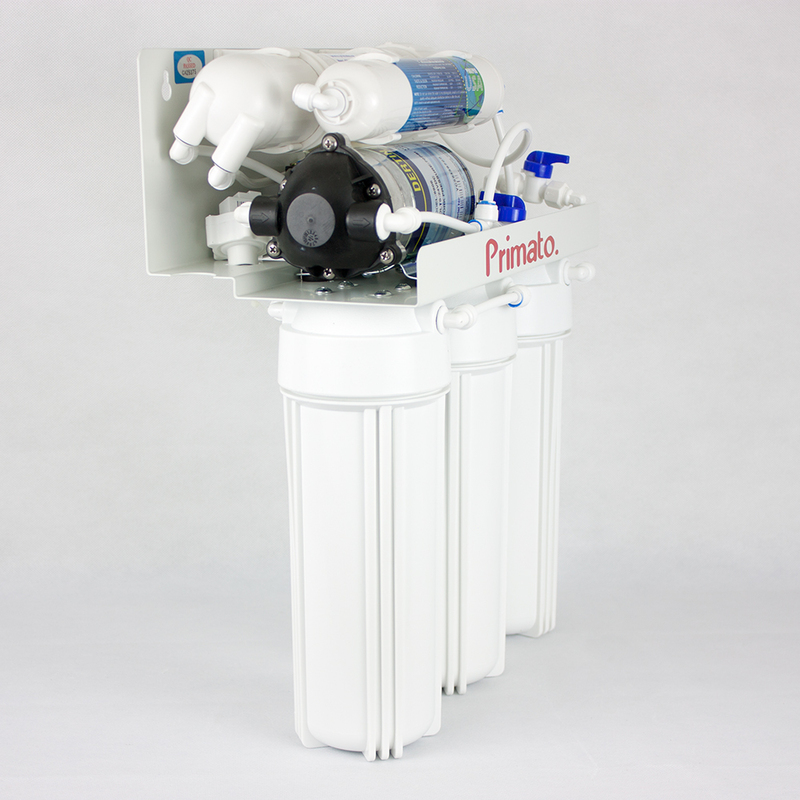 If you use drilling water then you need a reverse osmosis filter. Whatever problem you are facing with your water, if you are not sure, just contact us! We will be glad to find the right water filter! "How do I remember when to change my cartridge?" Forget abou it! When it's time to change your cartridge, we'll call you or email you to remind you! "If some part of the filter breaks, do you have spare parts?" 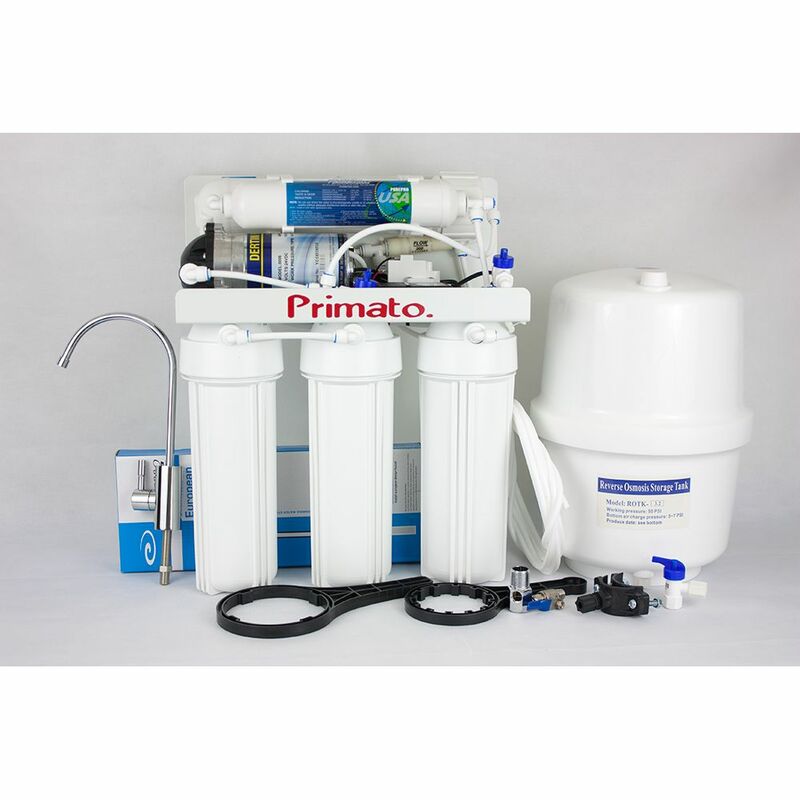 We have all the parts you may need for your water filer. "What does the warranty include?" In order for the warranty to be valid, you must maintain the filter correctly (of course it's not valid if you break it yourself and you should use the cartridges displayed in our website. If you clean your water filter internally every time you change the filters and if you change the filters at the scheduled time, your water filter should last for many, many, many years. If, however, your water filter has a problem of our own fault, (even if it was damaged during transportation) , we immediately take it back at our own expense and send a new one as soon as possible. "I have lost the wrench and can not unscrew the device to change the cartridge"
We have all the parts you may need for your water filter, including the wrench. Feel free to contact us for assistance. "I can't or I don't want to order electronically. Is there any other way?" Of course! Just call us at +30 2310 383 588 and we'll take your order over the phone! "I want to pay using my credit/debit card, but I do'nt have good computer knowledge." No problem! Just call us at +30 2310 383 588 while you are on your computer and we will help you order online step by step. "How long does the courier need to deliver the products to my house?" Click on the "SHIPPING AND PAYMENT COSTS" located under the product's price for details. "What if my water's quality changes?" Contact us to find the right filter for you or browse our website to check all the available cartridges. "Who will install the filter?" Each water filter includes instructions in case you want to install the water filter yourselves. We've also made installation videos. You will find them on the product page you are interested in. Of course our experienced technicians are always on duty and at your disposal if you need assistance! 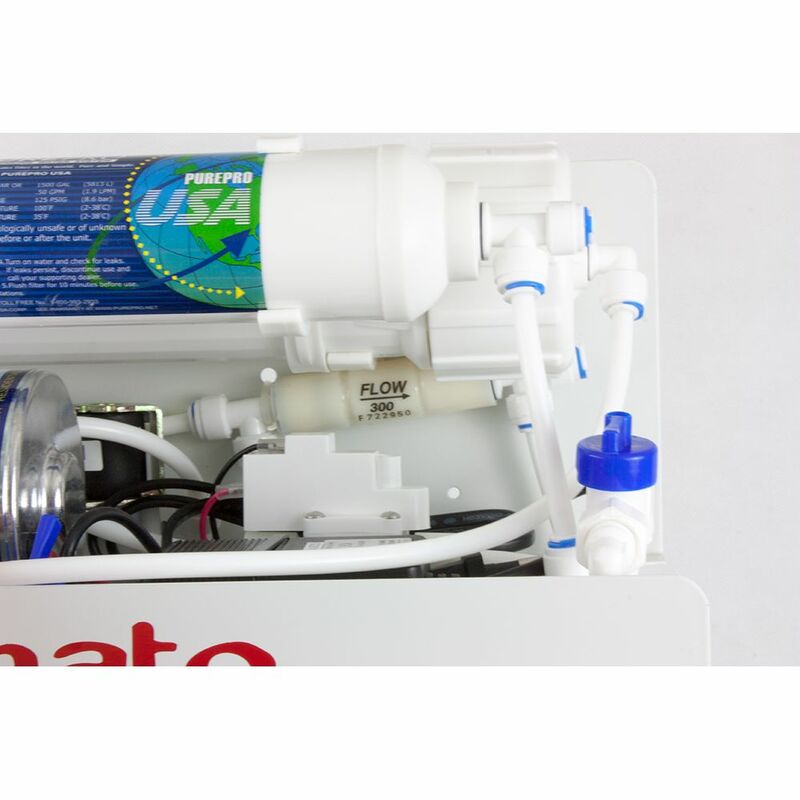 Instructions: Add this water filter to your cart. Then add as many of these cartridges as you want. You will automatically get a 20% discount.